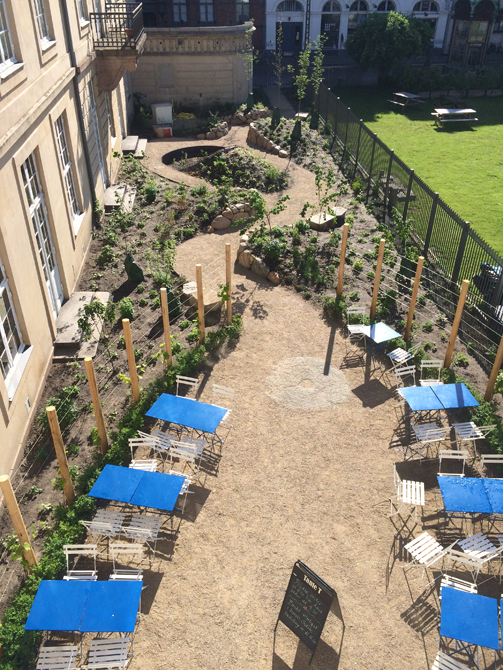 These projects are opportunities to develop overlooked and underdeveloped places. It is a way to integrate how we move through space with my passion for environmental issues, sustainability, and the merging of form and function. My goal is to make each piece of earth productive and beautiful so as to encourage us to take a moment to look, smell, and feel in the urban landscape. 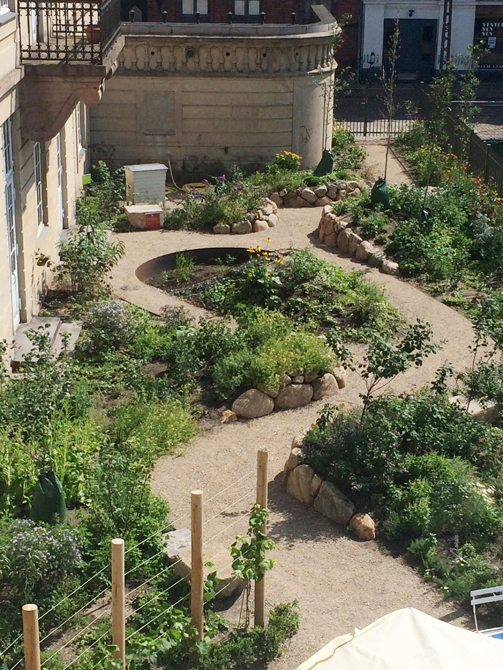 Designed for the Museum of Copenhagen’s Urban Nature exhibition, the museum’s flat, grass covered backyard was transformed into a space of varied levels and outdoor rooms, connected by a flowing path and surrounded by layered plantings that provide nourishment and space for people as well as pollinators. Intersections is about the encounter between nature and culture, and the movements and negotiations between the two. The space transitions from a cultivated and ordered garden to gradually transforming into something more wild and natural. 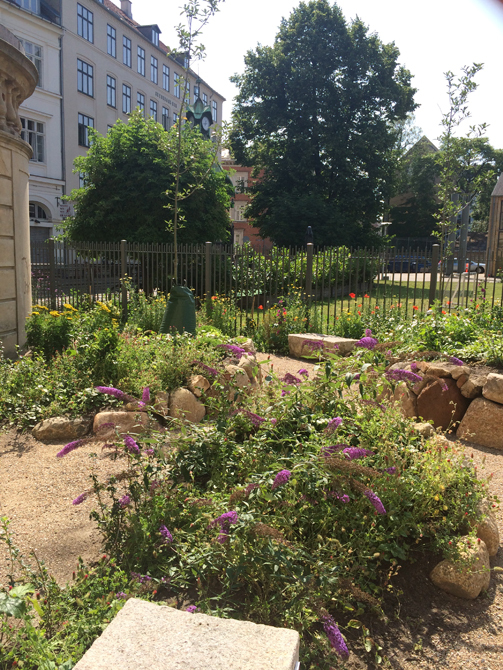 This is embodied by the choice of fruiting trees, berries and vines in the first section, and perennial plantings for bees and pollinators in the other. 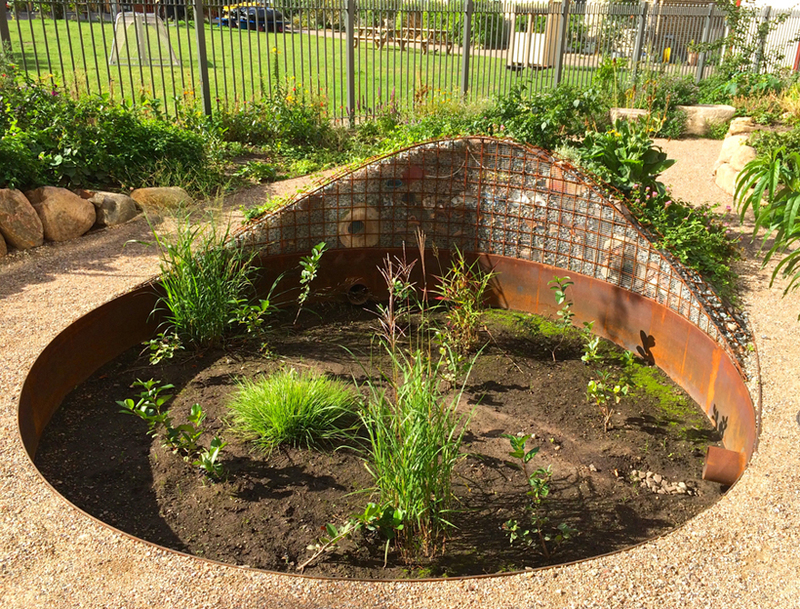 The garden is both a place for contemplation as well as a space that offers the opportunity to reflect on biodiversity and balance with nature. 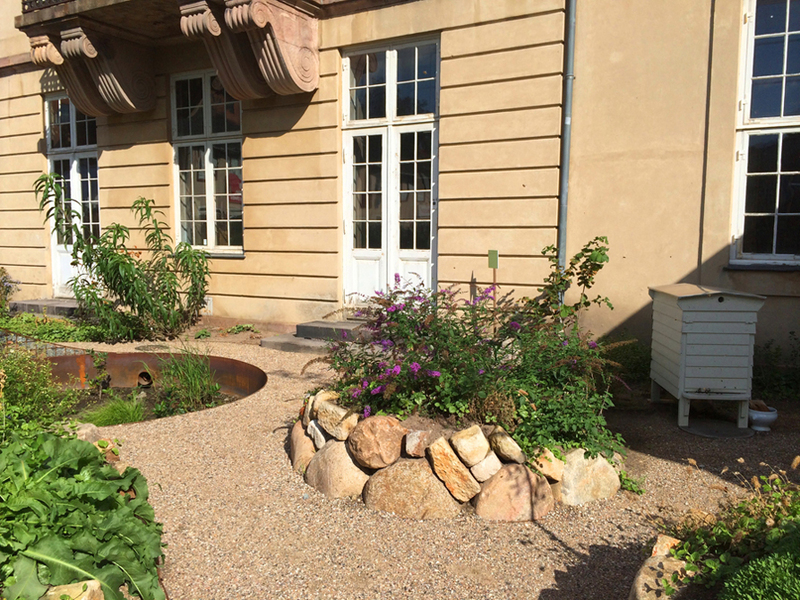 Part of the plan included disconnecting the museum’s downspouts from the sewer system and creating water-holding areas within the garden itself. Another essential component was to reveal aspects of the layered history of Copenhagen which the museum’s archaeologists and historians were addressing daily in their excavations in the old part of the city. 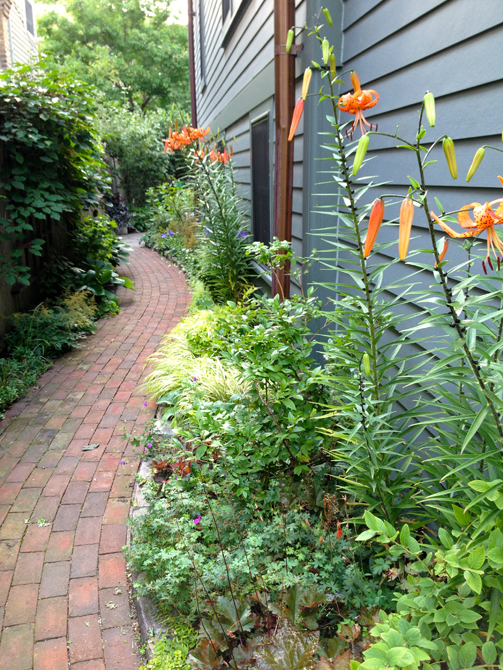 Developed for a thriving and well-used community art center, the long narrow garden that runs along the side of the building was developed to create a variety of perennial plantings to sustain interest throughout the growing season to make this as interesting as possible to walk along. On top of the four-story building sits a deck and a small section of green roof, almost like a meadow. 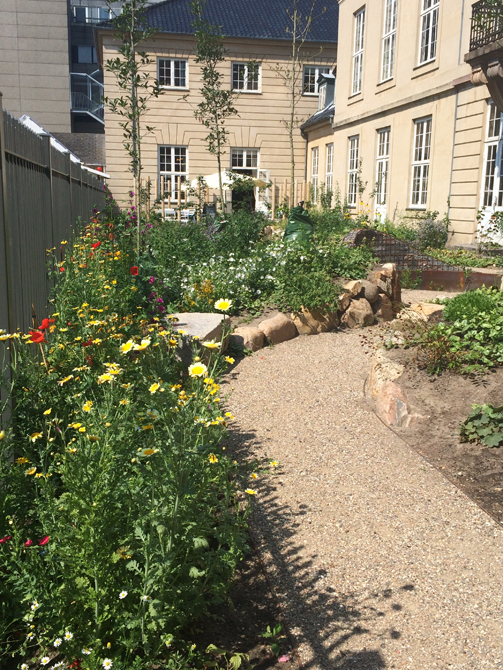 The focus is on some edibles, herbs, and plants for pollinators. The roof is also home to six bee-hives. 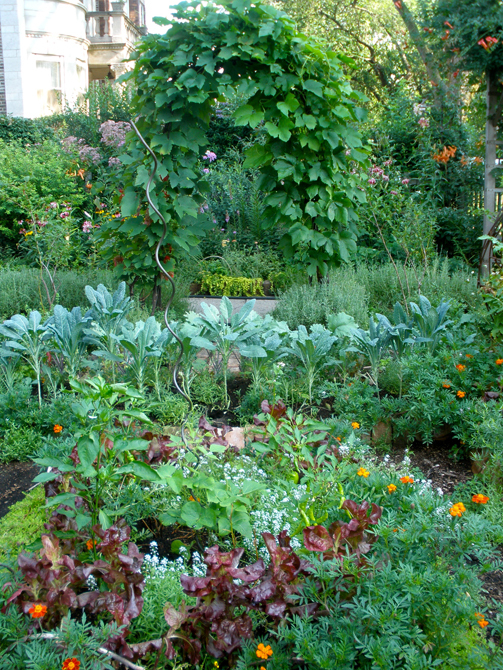 The goal of this garden is to make every part of the space to be as productive as possible. All grass was removed, including the parkway. The sun was in the front, so a raised bed vegetable garden was put in on one side and perennials on the other. There are many trellises supporting hardy kiwi, grapes, and black raspberries. Other fruiting shrubs include blueberries, currants, logon berries, jostaberries, elderberries. Each summer greens, beans, and tomatoes, etc. are planted. 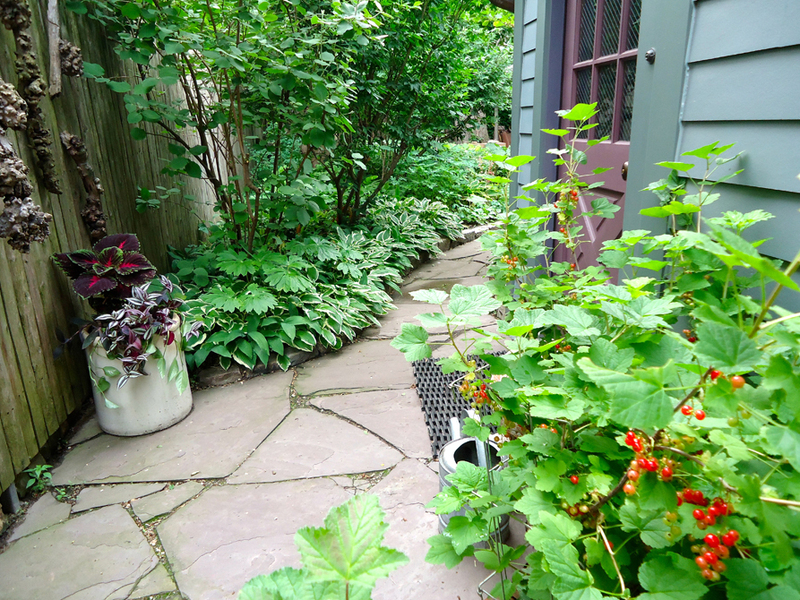 The backyard is a shade oasis, intended to feel a little like the edge of the woods with layers of textures and green tones. Under mature Siberian elms, many spring bulbs thrive, as do witchhazels, small maples, dogwoods, viburnums, hydrangeas, hostas, myrtle. 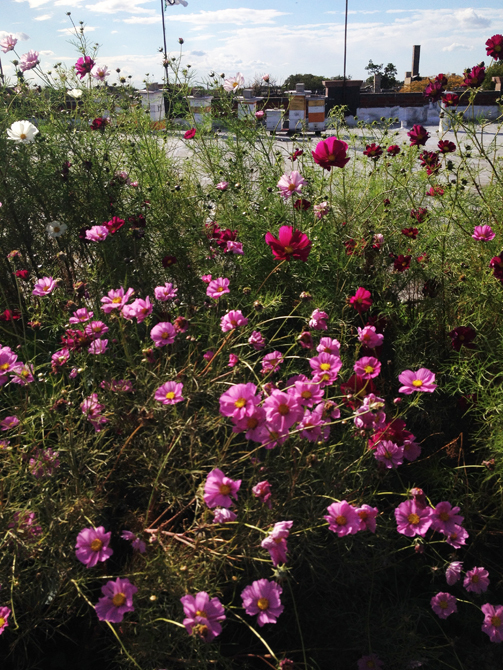 There is a composting area and there are bees. The parkway is totally devoted to pollinator plants, though they exist throughout the garden, back and front.